When it comes to heavy duty work and water requirement, the Havells submersible pump is a great and pocket friendly choice. 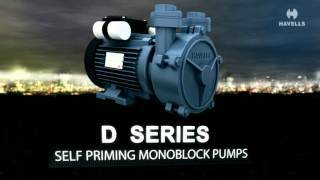 This range of pumps is self-primed and needs no other invention to work along. Once installed, they are always as good as new and can be used for a long time without worrying about replacement. Havells has wide range of products and we lay emphasis on quality without compromise. Check out the range of products available on the website and get home the one that suits your pumping needs the best. Be it home, industry or a farm, our submersible openwell pump range gives satisfactory results in every situation. Submersible pumps with F class Insulation and IP 55 protection to ensure smooth performance in the outdoors. Dual coated H Class copper winding wires gives high motor efficiency.